​​Sir Roger Kirkpatrick (1245- abt. 1323) was the oldest son of Stephen Kirkpatrick, Lord of Closeburn, Dumfrieshire, Scotland and became Lord of Closeburn after his father’s death. Sir Roger married Lady Margaret de Somerville, the daughter of Thomas, Lord of Somerville and Jane Stewart. Lady Margaret was a direct descendant of Alfred the Great, King of England. Sir Roger was the 3rd cousin of Robert the Bruce, King of Scotland and 1st cousin of Sir William Wallace. Sir Roger and Lady Margaret’s children were: (1) Thomas; (2) Roger; and (3) Alexander. ​In 1304, King Edward I of England appointed Sir Roger one of the deputy justiciars of Scotland, given responsibility for Galloway in partnership with the English justiciar Walter de Burghdon, this appointment is recorded in the Ordinances of 1305, by which Edward I attempted to order the administration of a Scotland reduced to the status of a 'land' instead of a realm. 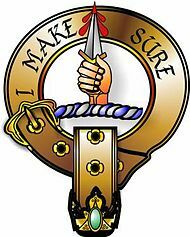 Sir Roger, being 1st cousins with Sir William Wallace, was Wallace’s constant companion and was one of the ones who voted for William Wallace to be “Warden of Scotland” in 1297. Sir Roger fought alongside Sir William until Sir William was betrayed and executed on August 23, 1305. In 1306, Sir Roger’s other cousin, Robert the Bruce was in competition with his rival, John (Red) Comyn to become King of Scotland. Comyn would not the Scottish nobles without Robert the Bruce so a meeting was arranged between Comyn and Bruce for Thursday, February 10, 1306. The location was a church, Greyfriars in Dumfrieshire. Sir Roger and James de Lindsay waited for Robert the Bruce outside of the church . The conference resulted as Bruce had anticipated it would. Comyn would listen to no other solution of the problem save one that would compel Bruce to retire from the field and permit Comyn to rule Scotland. The discussion resulted in a new and greater hatred. Finally Bruce, seeing Comyn reach for his dagger, drew his own, and warding off the stroke of Comyn, drove his own dagger into the breast of his rival. Rushing to the door he was met by his friends. After the killing of Comyn, Bruce and his friends proceeded to Scone, the ancient seat of Scottish inauguration, and was there crowned, 27th March, 1306. But he was not permitted to retain his throne undisturbed. He had enjoyed royalty but a short time, when he was defeated by an army sent against him by Edward I.; after which he was obliged to live in an obscure condition for a considerable time, during which his enemies tried every method either to take him prisoner or to destroy him, and he was compelled to take refuge in various places, among others at Closeburn Castle, where he was from time to time effectually concealed by Sir Roger Kirkpatrick. The place of refuge was a steep hill, called the Dune of Tynron, upon the top of which there still remain traces of a small fort or habitation; and in former times it was surrounded on all sides by very thick woods. This hill is still shewn as the place of refuge of King Robert Bruce. Edward carried on the contest with various success till the famous battle of Bannockburn, 24th June, 1314 when Bruce obtained a complete victory, by which his sovereignty was established. Wha sae base as be a slave ? One of the last recorded public achievements of Sir Roger Kirkpatrick is the part he took in the Battle of Bannockburn, in 1314, where at the head of 5,000 horsemen he took part in the final charge that crushed the English army of King Edward. It has been reported that both Robert the Bruce and Sir Roger were excommunicated by the Pope due to the killing in the church. King Robert Bruce had made a vow to go to the Holy Land to compensate the death of Comyn. Unfortunately, all the fighting during his reign prevented him from going and he desired that his heart be taken to Jerusalem. Sir Douglas wore King Robert’s heart suspended from his neck in a silver casket and was accompanied by a son of Sir Roger Kirkpatrick and other knights to Jerusalem. The Kirkpatrick family was later pardoned by the Pope for their part in Comyn’s death, who reasoned that Bruce’s blow against Comyn was likely mortal. Sir Roger Kirkpatrick has been written about in many books. He has been immortalized by not only Robert Burns, but also Sir Walter Scott and one of the earliest known poets of Scotland , Blind Harry. It is unknown the exact date of death or circumstances of Sir Roger Kirkpatrick at this time. Sir Roger also had a son named Roger, nickname “Hoge”. Hoge was very involved in Scottish affairs of state and was sheriff of Dumfrieshire by 1356. After the Scottish wars of Independence, Edward of England possessed Caerlaveroch Castle which had been in the possession of the Maxwell family. After a battle between the Scots and English, Hoge was awarded possession of Caerlaveroch Castle which was proven by his signatory seal on a document issued in 1357. One night in late 1357 an incident occurred at Caerlaveroch known as the Caerlaveroch murder. It is said that after a visit by his friend James Lindsay of Dunrod ( it should be pointed out that these two men were the sons of the pair who committed the murder of Comyn , each having the same names as their fathers ), after leaving, James Lindsay sneaked back in the night and murdered Hoge in his sleep. It is said that it was over a woman, but it will never be known for sure. One old story is that on the night of Comyn’s death a kinsman was keeping vigil over his body as he lay in state in the church he was killed in. It was customary to keep vigil over bodies since they were often looted. During his vigil the kinsman heard a deep sobbing coming from inside the church, which was empty apart from he and the dead Comyn. The sobbing becoming a loud weeping and wailing. A voice then resounded, wailing out in a loud and pleading tone "When god? When will vengeance be visited on the evil "heads who committed such a crime in your house?" To which the reply in a loud booming voice was, "When fifty two summers have come and gone then vengeance shall be satisfied". Some say this was divine retribution, the sins of the father visiting the son, whether or not this story is true, the fact remains that 52 years after the slaying of Comyn the sons of the men involved were involved in another murder. Lindsay was caught the same night he murdered Hoge, less than 3 miles from the murder scene. The king took a personal interest in Lindsay’s summary execution at Caerlaveroch. Hoge was well thought of by all, from commoner to king. He was the first and last Kirkpatrick of Caerlaveroch. ​Caerlaveroch Castle was later returned to the Maxwell family.